Yesterday was Australia Day that falls on 26 January every year. It’s an official national public holiday for celebrations. Many friends of mine will make use of this opportunity to travel, or stay at home doing some gardening. For me, I like to hide myself in some cool places and enjoy some refreshing, cold drinks or chilled desserts as we are still in hot summer here. This Mango and Tapioca Pearls Dessert was made with an Australian mango in season. It’s quite large, about 510 grams, juicy and sweet. I cooked some tapioca pearls to go with it. The texture of this dessert was like something between drink and pudding. 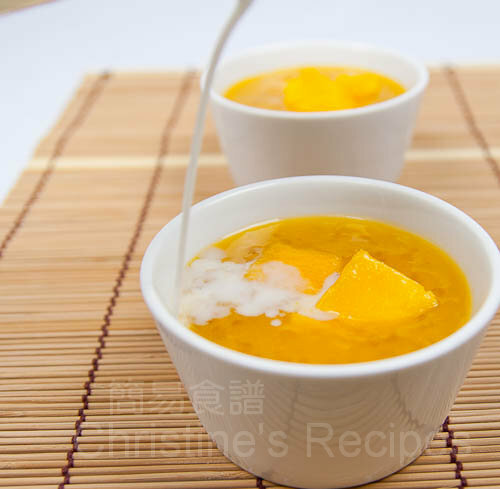 We call it “露” in Chinese, roughly translated as “chilled dessert”. Hong Kong people like to use all kinds of fruit to make chilled dessert, including water melons, rock melons, lychees, all those favourite fruits in summer…Mango is the most popular choice in chilled dessert, I guess. When serving, you can also mix in some milk or coconut milk to add more flavours. Soak tapioca pearls for at least 3 hours. In a sauce pan, pour in some water. The amount of water should cover all tapioca pearls. Bring it to a boil. Add tapioca pearls to the boiling water on medium heat. Stir them constantly and make sure that they don’t stick together. After cooking for 15 to 20 minutes, remove from heat. Cover and let sit for another 30 minutes. The tapioca pearls should be translucent, without any white dots in the middle. They are done. If they are not ready, turn on the heat again and cook for a few minutes more. And then let sit for a while again. Drain tapioca pearls and rinse under cold water. All tapioca pearls should be cool to the touch. Cut mango into cubes, about 1 1/2cm in size. Save 1/3 of them. Blend the rest of mango cubes, ice cubes and sugar in a food processor into thick juice, about 1 to 2 minutes. Transfer into a large bowl. Mix in tapioca pearls. 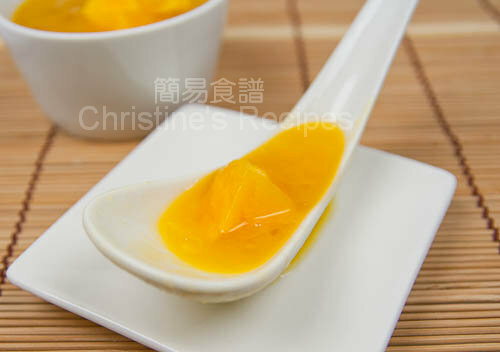 To serve, divide mango juice with tapioca pearls into 3 to 4 small ramekins, top with mango cubes. Serve cold. This looks amazing! Definitely a 5 Star dessert and a must try for me! What a great mango dessert! I have some sago in the pantry, might give this a try soon! this is one of my super favorite dessert! i really want one now! with coconut milk PLEASE! 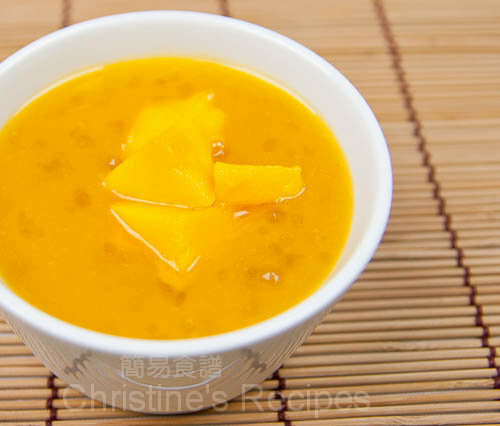 Great idea to combine mango and tapioca pearls! Mango is my favorite fruit. I like recipes having mango flavor. Thanks for this recipe. So glad to have found this delicious recipe. Do you have a picture of how the Aussie mangoes look like ? What color is the skin? Green? your picture makes me want one bowl already! We have different kinds of Australian grown mangoes. One of my favorites is Kensington (the brand's name). Inside the fruit is golden yellow, very beautiful. I loved Bowen before, now it's gone. Some people say, Kensington is Bowen. But I'm not sure. My pictures of Aussie mangoes are here and here. Can never resist some good refreshing mangoes for dessert! they look so mouth watering, Christine!! Never thought of mango with sago. Looks very delicious. Love the beautiful colour too. Happy Australian Day. I have some ripe mangos and may have to celebrate from the other side of the globe. What a wonderful sounding dessert! Love the look of this dessert! Yum! I love mango. So I know I will enjoy this. Thanks.